It's almost as contentious a question as, "which is better, Lafayette or American?" 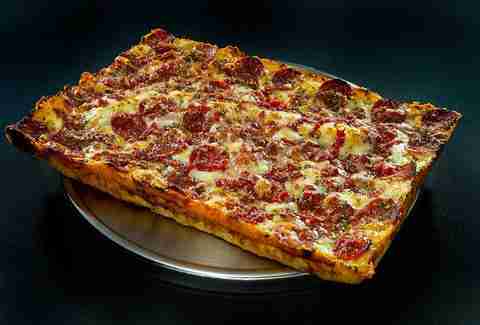 -- who makes the best Detroit-style deep dish pizza? Now, as we all know, not all deep dish pizzas are created equal. (We're looking at you, Chicago. Your deep dish is terrible and everyone knows it. Even Jon Stewart!). 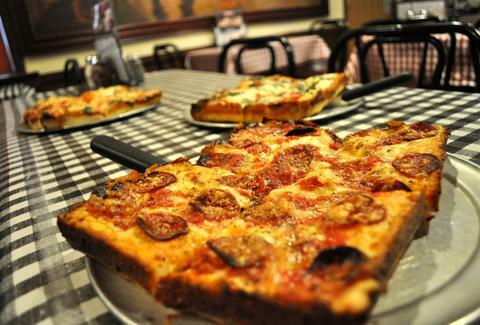 We might be just a BIT biased, but screw it -- the best deep dish comes from Detroit! 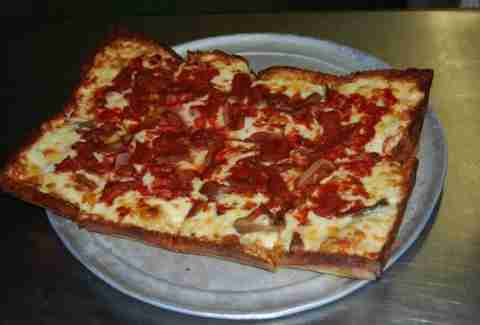 There are four locations of the Green Lantern Pizzeria located throughout metro Detroit. Two of them are carry-out and delivery only, and of the other two, only one (Clinton Township) serves the Detroit-style square deep dish. There doesn't seem to be any great rhyme or reason to it, so let's just suffice it to say that Green Lantern is sort of your quintessential suburban dive-bar-meets-family-restaurant (the kind of place where the servers and bartenders know most of the customers by name, and the steady crowd consists of grizzled old-timers drinking away their afternoons, neighborhood families out to dinner, teens trying to escape their families, sports fans watching the latest "The Game", and all other varieties of local bar and restaurant frequenters). They also happen to serve really great pizza. And if Madison Heights is more convenient for you than Clinton Township (and it probably is), their round deep dish is also damn good, even if it's not "Detroit-style". One of our chefs said simply, "Jet's is the truth." And so it is written. This Sterling Heights-based chain might be a little more corporate than the family-owned Buddy's -- its history has become the stuff of local legend, and its unglamorous carry-out/delivery-only stores lack the atmospheric charm of the original Buddy's (with a bocce ball court) on Conant. BUT. When you open that square red-green-and-white box and that mouth-watering aroma of spicy pepperoni, succulent sauce, buttery crust, and bubbly cheese comes wafting out, there is no denying: Jet's IS the truth. In fact, several respondents said Jet's Pizza was one of the things they miss most about Michigan (though those responses didn't make it to the final cut – you'll just have to trust us on this one). AKA, the grand dame of Detroit deep dish. There are several Buddy's locations throughout metro Detroit, but only one has a bocce ball court: the OG 6 Mile and Conant location, opened in 1936, where Detroit-style deep dish pizza was born (6 Mile and Conant looked a little different back then). 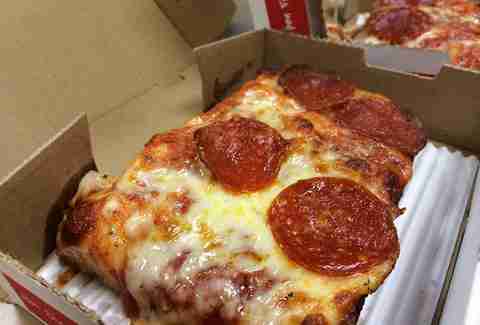 In honor of its heritage, they even make a Detroit-style pizza called "The Detroiter", with cheese, pepperoni, and tomato basil sauce, topped with shaved Parmesan cheese & Buddy's signature spice blend. 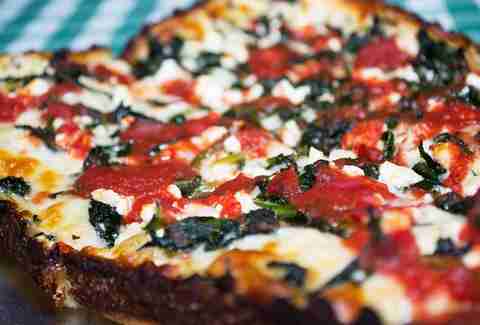 We're not really sure what is innately "Detroitish" about that pizza, but something something... Detroit! Buddy's has gone on to be featured in just about every national food magazine and TV show since then, and they've also diversified their offerings to include more contemporary selections like multi-grain (!) and gluten-free (!!!) crusts and vegan (!!!!!) pizzas. A side note to those who are vegan and gluten-free: sometimes there are just going to be things you can’t eat, okay? The world called and said it actually revolves around the sun, not you. (It's true, we saw it on Cosmos). 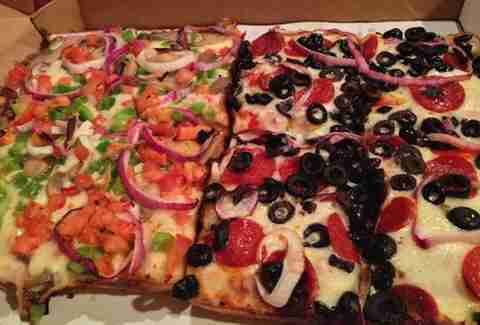 What an upset -- Buddy's gets spanked out of first place by this humble Hazel Park pizzeria! There will come a time when Hazel Park is christened as the new Ferndale (it's coming, mark our words), and when that time comes, Loui's Pizza will be that old-school mainstay neighborhood pizzeria that's popular with lifers and hipster newcomers alike (i.e. the new Como's). Loui's is untouched by time, and our chefs love the place as much for their perfect square deep dish pizza as for their eye-talian ambiance -- Chianti bottles wrapped in straw baskets ("fiaschi"), signed by those who drank them (if you look closely, you'll find a few signed by some of our chefs). These joints also received some chef love: Primo's Pizza, Birmingham (5 points); Hungry Howie's, multiple locations (3 points); Rosie O'Grady's, multiple locations (2 points); Alex's Pizza, Wixom (2 points); Shield's Pizza, multiple locations (1 point). Author's note: It would seem none of our responding chefs spend much time on the East side, because if they did, they would know that Cloverleaf Bar & Restaurant is just as good as Buddy's -- as well it should be, since it's the same exact recipe carried over from when the original owners of Buddy's Rendezvous, Gus and Anna Guerra, sold the business and headed to East Detroit (now Eastpointe) to open Cloverleaf with Anna's mother's recipe for the thick, square crust pie that made Buddy's famous. And a special thanks to all of our participating chefs willing to share with us how they like to slum it: James Rigato (The Root), Michael Barrera (Streetside Seafood), Andy Hollyday (Selden Standard), Justin Vaiciunas (Top of the Pontch, Jefferson House), Paul Grosz (Cuisine, The Stand), Dave Mancini (Supino Pizzeria, La Rondinella), Marc Djozlija (Wright & Company), Derik Watson (Bistro 82), and Kate Williams (Republic, Parks & Rec Diner).